Are you managing multiple sites on one or more UniFi SDN Controllers and have you ever spent too much time searching for a specific device? Or did you ever attempt to export the details and serial numbers of the devices you manage to an Excel sheet? That’s where our UniFi Device Search tool comes in handy. 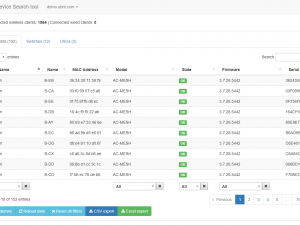 This tool was developed to help you quickly find a single or a group of UniFi devices across all sites managed by a UniFi SDN Controller by using multiple filters and a search option. The results can easily be exported to CSV and Excel. Fast switching between multiple controllers is also supported.